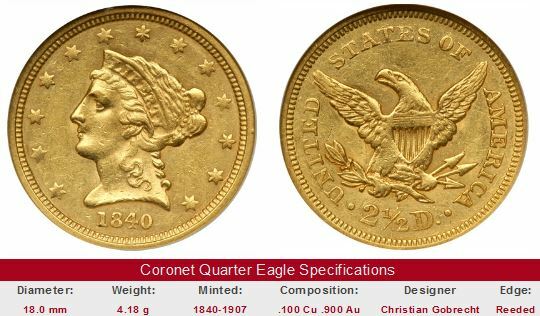 Coronet Quarter Eagles 1840-1907: Coin Value, Key Dates, and Historical Info. In 1840, the Coronet Quarter Eagle was released. The Coronet type, also called Liberty Head by many numismatists, was to become the enduring workhorse of US gold coinage. It was produced every year until 1907, during which time the United States matured from a rowdy frontier nation to the brink of world superpower. Mint Engraver Christian Gobrecht first unveiled his Coronet design in 1838 on the new $10 gold eagle. The $5 half eagle and $2.50 quarter eagle were updated to match the Coronet style, in keeping with the Mint policy of uniformity across gold coinage face values. The Coronet design featured Miss Liberty facing left, wearing a small crown, or coronet, inscribed with the word LIBERTY. The thirteen stars around the edge represent the original American colonies. The reverse is dominated by an eagle with a shield covering its chest and greatly resembles the work of former Engraver John Reich, first released in 1807. The eagle carries an olive branch and three arrows to symbolize both peace and military readiness. In 1848 approximately 230 ounces of newly mined gold from California was sent to the Philadelphia Mint, where it was coined into quarter eagles. The lettering "CAL." was punched above the eagle to distinguish the origin of the bullion. Only 1389 such coins were produced. Today, a collector can expect to pay a minimum of $15,000 for this important historical rarity. Serious buyers absolutely should not consider anything that has not been certified by a reputable grading service. Many fakes of this famous coin exist. One of the most famous Coronet Quarter Eagles is the 1848 "CAL." specimen. This coin was minted from a special shipment of gold sent from California to the east coast just months following the fabulous gold strike. 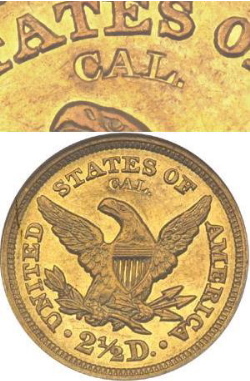 The letters “CAL.” were counter stamped on the reverse above the eagle by Mint officials to show that they were coined out of gold originating from the California gold fields. Only 1389 of these quarter eagles were produced. One of the finest known examples of the CAL. quarter eagle, graded MS-68 by NGC, was sold for $345,000 in January 2008. As one might suspect, many forgeries of this historically significant rarity are around. Even scarcer than the 1848 CAL. is the 1841. Believed to be issued only in Proof condition (there is some controversy here), the exact mintage is unknown, but it is most certainly a microscopic quantity, perhaps no more than 20. Collectors have affectionately labeled this highly elusive rarity the “Little Princess”. Seldom does a “Little Princess” example publicly traded hands. The 1854-S is another legendary rarity. Only 246 of them were made at the San Francisco branch mint, during its first year of operation. It is the lowest mintage of any quarter eagle intended for circulation. An 1854-S graded as XF-45 sold for $345,000 in February 2007. Not all of the key date Coronet Quarter eagles are out of sight, however. Anything from either the Charlotte or Dahlonega mints will always excite serious collectors, and are well worth their cost. Also, some of the lowest mintages recorded in the 68 year run of the Coronet Quarter Eagles are with the 1864, 1865, and 1875 editions. Surprisingly, this trio has been stagnant the last 15 years or so, defying their stellar growth patterns of previous decades. Perhaps they are overdue for some powerful upward adjustments. You may be setting yourself up for a big disappointment if you try to buy key date Coronet Quarter Eagles that have not been certified by one of the four leading grading service companies: PCGS, NGC, ICG, or ANACS. Most collectors have some degree of confidence in coins graded by any of the Big Four, and are willing to write bigger checks accordingly, should you decide to sell. Conversely, many would-be buyers are cool to coins passed through lesser known services, because all to often, these outfits have demonstrated much less stringent standards in grading. Then too, there are "grading" outlets operating as fronts to pass off "rare coins" that are fake or altered. The links below initiate a search of eBay coin auctions to find key date Coronet Quarter Eagles. The left hand side of each "Sales Box" depicts value trends over a very long period of time for the specified key date in F-12 condition. The percent annual increase since 1950 is computed for comparative purposes. In the case of Charlotte and Dahlonega coins, value trends of 1846-C and 1846-D are reported to typify the group. Key date Coronet Quarter Eagles are tough to come by, even in a universe as large as eBay gold coin auctions. Don't be surprised if much of the time, you come up empty handed. Keep checking back, and remember, be patient and follow the advice on grading. The coin pictured for sale in the right hand side, if any, is not necessarily the same condition coin as that represented in the value trend analysis on left hand side.